I loved writing this topic about The 2019 State of Disc Golf Growth because I myself am new to the sport of disc golf. I have heard of disc golf before, but never actually had gone out and played disc golf. I decided to see how the sport has grown from 2018 to 2019. 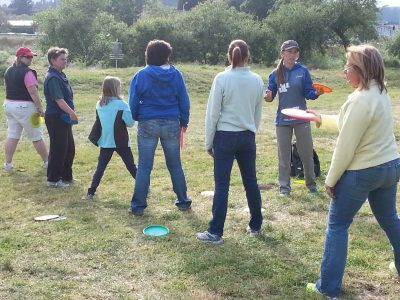 As a newcomer to the sport, I think this article was helpful to me to know what I can do as a new disc golf player to help generate more popularity of the sport. disc Most of us are familiar with the popular hashtag #GrowDiscGolf). The shared belief behind the rallying cry began with the first disc golf pioneers and became an integral part of the sport’s very personality as it spread to the next generation of new players, and then the next. The conviction that we have a duty to share the sport is encoded in the DNA of every die-hard player and has been for decades, long before the advent of social media. The 2019 State of Disc Golf survey asked several questions that sought to measure and identify the details of this most singular aspect of the sport – a topic which is finally attracting some well-deserved attention. Disc golf’s continuous and quick growth is obvious as we had more responses than the year before. Disc golfers across the globe are doing their part to grow the sport and with an increase of almost 10% in responses in our survey, you let us know what you’re doing to grow disc golf. In just the past three years we saw that nearly 14% of respondents had heard about disc golf for the first time. Compare that to when respondents actually played disc golf for the first time and that number is up to over 53%! We did see a slight dip in growth from 2017 (19.2%) to 2018 (17.4%). Our survey also showed that disc golfers are doing an amazing job at sharing the sport with others. 85% of our disc golfers have shared equipment, ran a disc golf league, or helped install a course physically. Last year, this number was at 88%, so again a slight dip in growth, but players are doing an amazing job at sharing the sport with their friends and family. Disc Golfers still have trouble growing the sport because the lack of courses available made to us. 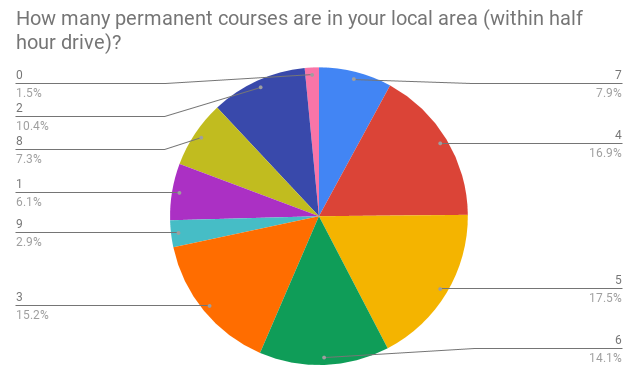 In our survey 63% said there were no permanent courses added to their area, and 30% said only one course was added to their local area. 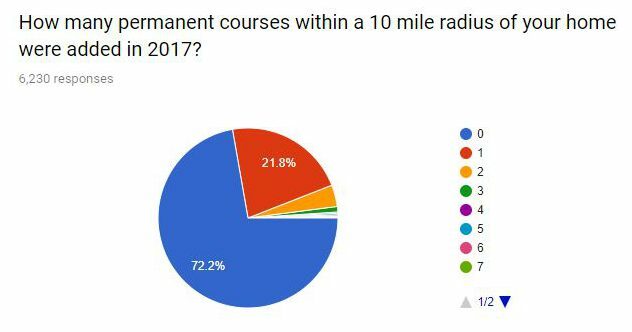 The number of courses added from last year to this year in our survey dropped about 10%! There is still growth being made but with well over half our respondents not having a new course built in their area means there’s still room to grow. could help explain why disc golf didn’t grow as much in 2018 as in 2017. What improvements do you all want to see in the growth of the sport in the year 2019? What are you going to do to continue to help Grow Disc Golf? Comment below and let us know. What improvements do you all want to see in the growth of the sport in the year 2019? What are you going to do to continue to help Grow Disc Golf? Comment below and let us know. As disc golfers, most of us watch professional disc golf. 85.6% of those surveyed said that they watched professional disc golf at least once in 2016. The preferred method of watching professional disc golf is after production YouTube videos where nearly 94% of those who “watched professional disc golf” participated. About two thirds of those who watched professional disc golf spent time watching live videos (30.8% less than post production). 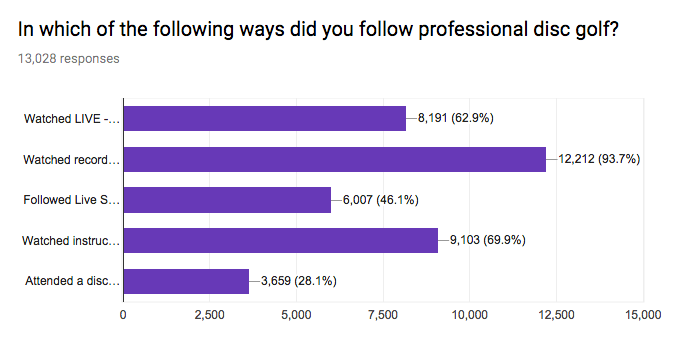 46% followed live scoring during tournaments, 70% watched instructional videos or clinics, and 28% attended a tournament where they watched the pros live. 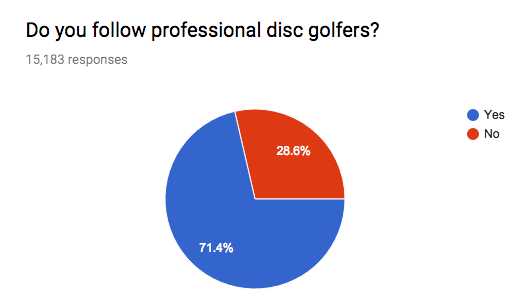 71.4% of those surveyed follow professional disc golfers. 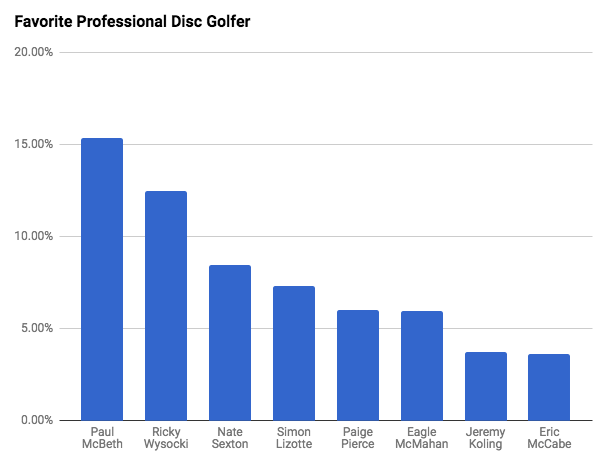 At Infinite Discs, we regularly see the impact of professional disc golfers as their “signature discs” regularly outperform sales of ordinary stock discs. Among those that follow Professional Disc Golfers, Paul McBeth, Ricky Wysocki, Nate Sexton, and Simon Lizotte were the favorites of 2016. Many disc golfers get their disc golf news and pro information by listening to podcasts. 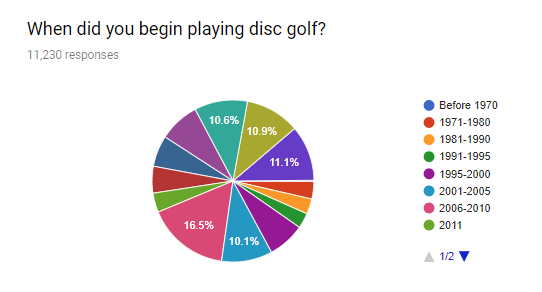 28.9% of those surveyed said that they listened to at least one disc golf podcast. The most popular disc golf podcast according to respondents is Smashboxx.TV (71%) with the Disc Golf Answer Man (64.1%) close behind. 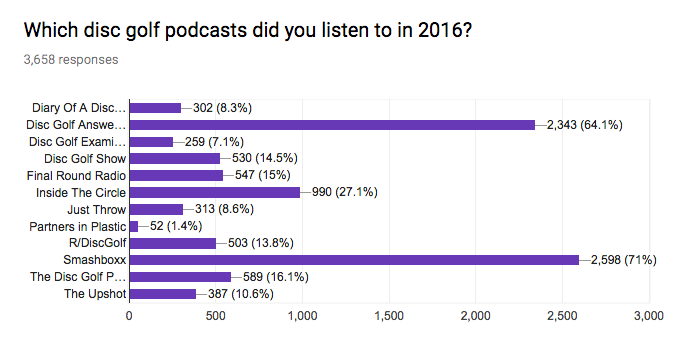 Inside the Circle was the only additional Podcast that at least 20% of Podcast Listeners had tuned into at least once. 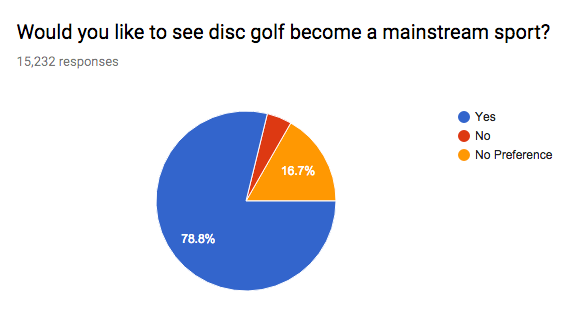 Most of the participants surveyed (78.8%) would like to see disc golf grow and become a mainstream sport. Only 4.5% would like disc golf to stay small while 16.7% have no preference. This weekend Northern Utah will host the Pureline Championships disc golf tournament on the Sherwood Hills “ball golf” course. The TD, Steve Suhaka, has spent countless hours meeting and negotiating with the course owners and groundskeepers to allow us to have this tournament there. The price agreed on to reserve the course for the day is not cheap, but the course is amazing, and we’re hoping that this tournament will open doors for potential of a future permanent disc golf solution on this underutilized land. I don’t have financial numbers, but know from general observation that this golf course is rarely (if ever), at full capacity. The course, including 200 acres of land and a nice club house is currently listed for sale for just $2,000,000, which leads me believe that the golf course itself is not very profitable. When I called to make a “tee time” to play a round this afternoon and the course pro admitted that it’s never busy so reserving tee times isn’t necessary. Why are the course owners opposed to having disc golf on golf courses if it has potential to bring extra revenue for almost no additional cost? It would interfere with the “ball” golfers experience. The discs would cause damage to the greens, and nice greens are where the money is made. I saw this video on my Facebook feed this morning posted by Dude Apparel that illustrates the cultural judgements of Skiiers attitudes towards Snowboarders in the 1980’s. When this news report was filmed, ski resort operators simply refused to allow snowboarders to ride their lifts. A similar attitude likely exists between many “golfers” and disc golfers. The reason they are likely opposed for now is because they don’t fully understand. Is this a real issue? Is it simply judgments and stereotyping that make it difficult to get disc golf on ball golf courses, or are there negative consequences that make having the disc golf option a bad idea? After having the temp course in for two days the feedback has been overwhelmingly positive. The course manager has even requested that we leave the baskets up for a few more days. Now that it appears we have overcome the stereotyping and potential conflicts, it looks like having a coinciding permanent disc golf course might indeed be a real option. If we look at golfing trends, a disc golf option really is something many golf courses should consider. Here are trends showing the number of golfers in the United States according to the National Golf Foundation. As you can see, the trend over the past five years has been declining for both “total golfers” and “committed golfers”. In disc golf there isn’t a survey that accurately reflects the total number of people that play disc golf in a way similar to the NGF data. However, the trend in active PDGA member clearly shows a rapid increase in the amount of tournament participating disc golfers. While the number of open ball golf courses has declined for the last decade, the number of disc golf courses have dramatically risen in most areas. This Graph is not an apples to apples comparison, but the trends are clear. For statistics used in the graph, ball golf only counts 9 hole courses as a “half” course, and the number of disc golf courses displayed is any sized course including the little 6 holer. 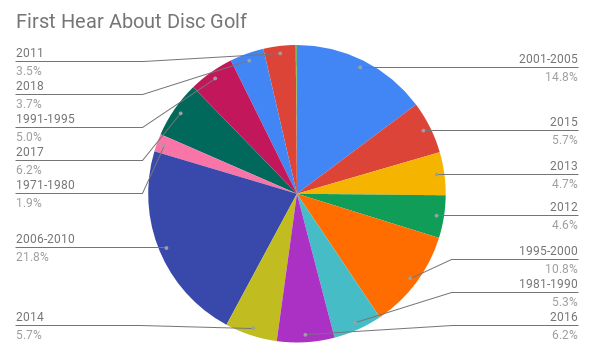 In addition, I was unable to dig up US only courses, so the disc golf course statistics displays course throughout the world and not just in the US. In Utah unprofitable golf courses, many of which are publicly owned, are a big problem for local governments and economies. Many cities have had to spend public taxpayer funds to pay the bills because the golf course revenue alone is not self sustaining. In recent years, several courses throughout the state have been shut down because they simply lost too much money. The question of what to do with the current public golf courses has been a political hot topic. One of these courses, the Jordan River Par three course, was completely shut down as an operating golf course and has now been transformed into a permanent disc golf course that requires very little public maintenance. With disc golf, they don’t have to maintain expensive greens and fairways or mow as often. At the Jordan River course, it doesn’t even look like they water a good portion of the disc golf course. The reality is that most disc golf courses are in public areas that are free to play. In general, disc golfers are used to playing a round without financial constraint. However, if the course is excellent and well maintained, almost all disc golfers are willing to pay for a round of golf. From the 2016 State of Disc Golf Survey we see that 95.6% of disc golfers are willing to pay up to $3 for a round and almost 90% are willing to pay up to $5. There starts to be a significant decline when the rounds get more costly, but more than half–53.6% of respondents said that they are willing to play up to $10 per round. While the average disc golfer isn’t willing to pay as much per round as the average ball golfer, they are willing to pay to play. Perhaps many financially strained and closing golf courses could remain open by creating additional revenue streams through disc golf, even if disc golf is only available during non peak hours. The 9 hole Mulligans golf course in Ogden, Utah is now also a championship level disc golf course used for the Utah Open, a premier tournament that will be on the 2017 Disc Golf Pro Tour. With the way things seem to be going with our trial experience, perhaps we will also see the Sherwood Hills golf course on this exclusive tour. Have you played disc golf on a ball golf course? If so where is the course at, and what was your experience? 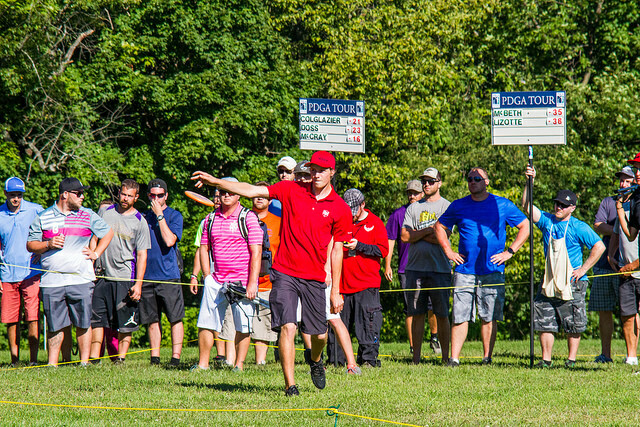 The State of Disc Golf 2014—Who Are You? In this first article, we hope to shed light on the question, “Who are you?” The first few questions of our survey asked a little bit about you specifically as a disc golfer. We asked: How long have you been a disc golfer, which state do you live in, and how often do you play disc golf? We acknowledge that the results here are a reflection of the disc golf community who is in some way, shape, or form, is involved with disc golf online. We recognize that it would be inaccurate for us to claim that this survey is a proper reflection of the entire disc golf community as a whole. While 1,422 responses in a week is fantastic (thank you everybody who took 15 minutes to respond! ), we must remember that there are many more disc golfers out there. Now without further explanation, enjoy the results. Where are todays disc golfers? The first question asked was “Which state do you live in?” All fifty states in the USA were represented, as well as a strong showing from Canada and outside of North America. California is dominant with 120 responses. Does this make California the top state for disc golf? Maybe. The image to the right is color coded according to where most respondents are from, as well as the number of respondents from their respective states. Our breakdown is this: the disc golf mecca of the world is still the great lakes area. With a strong and active disc golf community and more courses per capita than anywhere else – if you’re in love with disc golf, move there. California and Texas have sheer numbers of people and many courses to help numbers out. Areas such as Kansas and Utah show a disc golf scene which is starting to become fierce. Disc golf isn’t migrating into these areas, it’s just beginning to boom. How long have you been a disc golfer? Your responses to this question were not nearly as varied. Over half of those surveyed have been playing disc golf for only three years or less and 87% have been play for less than ten years. This is solid evidence to the claim that disc golf is the fastest growing sport in the world. Players in the sport are new to it, and those who have played for a long time are still going strong and loving it. Given more time, and the current rate of growth, expect to see higher level competition become more lucrative, professional, and exciting. A decent portion also responded as being in the 6-10 years of being a disc golfer category – this is where you will likely find many of today’s disc golf leaders. Those who have been playing for 6-10 years received 190 (15%) responses. Only 13% of disc golfers have been playing for 11 years or more. Those surveyed not only are aware of disc golf online, but they’re also active on the course. When respondents took into account the seasons and responded how frequently they play, you can see why courses throughout the country have trails beat in them near each tee pad. Most players hit the course at least two times a week, where a large core of players are out playing four times, five times… every day. Those who said they play “rarely” were only a blip on the radar; 4 people of the 1,422 respondents said rarely. Clearly, once a player catches the disc golf bug it stays and it’s contagious. Obviously, disc golf is growing. The floodgates are opening for the sport, and new players are coming out in droves. Where areas like Michigan and California were the primary centers for disc golf, you can now find a stronger and more organized presence of disc golf in nearly every state. A majority of players have been enjoying the sport for a short time – as these players continue to gain experience, watch the level of competition become more and more competitive, year after year. Results in coming surveys will reveal club participation and how disc golf is becoming more organized. Yes, the data is interesting; but it’s also useful. Feel free to use these results when approaching parks & rec about implementing and better utilizing disc golf in your community. These results clearly show that disc golf is exploding. We are headquartered in Utah where these results have already been shared with city officials to get additional courses approved. Explain to your local decision makers that disc golf provides an opportunity for people to get outside and active, and that it’s a sport that so many people can and will enjoy! What will change in 2015’s results? The next article in this series will be published on February 4, and will cover Disc Golf Memberships.